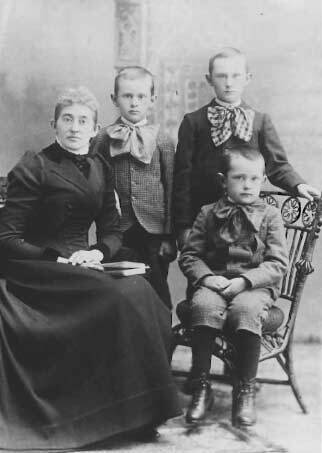 Carrie Williams, brothers Thomas, Merton and John (seated). Merton Y. Williams, was born in Bloomfield, son of Edwin Allison Williams and Carrie Bowerman. He had a brilliant career as a geology professor at UBC. Merton brought his research and writing skills to genealogy and left behind a body of quality work. Instead of formally publishing his major genealogy works, he distributed copies to family members and a few copies to institutions such as UBC, Picton Library, etc. Recently, niece Anne E. Williams has acceded her copies to the Prince Edward County Archives. Read his extensive obituary from the Picton Gazette. The Bowerman Family, 1379 to the Present, Merton Y. Williams, 1959. The pdf's below were made, with permission of Anne E Williams, from the copy she gave to the Prince Edward County Archives. Due to size, it is presented in 6 separate sections. William Mullett & Mary Clothier Family in Canada 1821 - 1869, Merton Y. Williams, 1964. The pdf's below were also made with permission from the copy given by Anne E Williams to the Prince Edward Archives. Note: The original document is very faint resulting in poor text conversion for searching. You will need to read the text. Bowerman Genealogy from the notes of David B Bowerman, 1930. Merton used the work of DB Bowerman and this document was in the papers given to the Prince Edward Archives. This library has copies of all his works mentioned on this page as well as these 3 not found elsewhere. The Merton Yarwood Williams Fonds held at the University of British Columbia Archives. See also this article by Jeffrey L. Staley. Family Records, written by my Grandfather, Levi Vincent Bowerman, abt 1904, typed by M.Y. Williams, 15 pages. Preamble to the Journal of Consider Merrirtt Haight by Merton Williams. A journey from Adolphustown, Upper Canada to Dutchess County and New York City, 1824, Haight, Consider Merritt, 1802-1838, Thomas Fisher Rare Books Library, Univ of Toronto. A second copy with an introd. by Merton Y. Williams, University of Toronto at Scarborough Library (later reprint? ).